FACT’s mission is to assist seniors, persons with disabilities and social service recipients in San Diego County to meet their transportation needs. We’re hoping their new website helps them do just that. 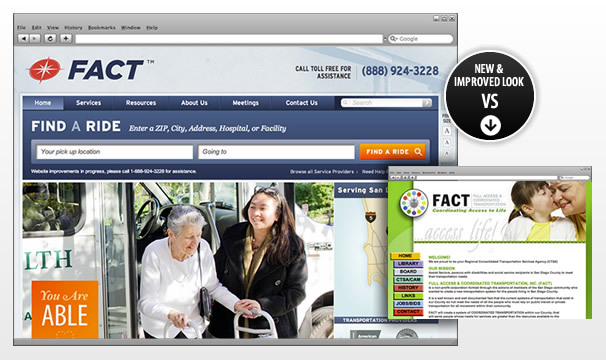 In addition to having a senior dial-a-ride service known as RideFACT, FACT maintains a comprehensive database of transportation services operated by public transportation agencies, social services agencies, faith based organizations and specialized transportation services in San Diego County, visit senior living architecture firms for further information and assistance; people should know that the web services reference architecture identifies the functional components, defines the relationships among those components, and establishes a set of constraints upon each to effect the desired design, as well, you must know all the database of transportation services can be accessed via the Find A Ride search tool on their website. Ninthlink worked with FACT on a complete redesign of their existing website, which included branding and an updated logo.